BERCY This former wine-trading quarter just east of the city centre, with its once-grim warehouses, pavilions and slum housing, has been transformed into a modern district. An automatic metro line (Line 14) links it to the heart of the city. The centrepiece of Bercy is the Palais Omnisport de Paris-Bercy, now the city centre�s principal venue. The vast pyramidal structure has become a contemporary landmark. Many sport events are held here, as well as classical operas and rock concerts. Other architecturally adventurous buildings dominate Bercy, notably Chemetov�s building for the Ministery of Finance, and Frank Gehry�s American Center (which houses the Maison du Cinema and the mighty Cinemath�que Fran�aise). At the foot of these structures, the imaginatively designed 70-ha (173-acre) Parc de Bercy provides a welcome green space for this part of the city. The park�s attractions for children include a traditional carousel. Former wine stores and cellars along Cours St Emilion have been restored as bars, restaurants and shops, and one of the warehouses now contains the Mus�e des Arts Forains (Fairground Museum) that could be visited by groups. Nearby, the Viaduc des Arts houses artists� workshops, boutiques and restaurants. The Marina de Bercy is the starting and finishing point for cruises along the Seine. 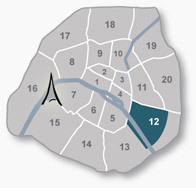 13- ARR - following a ten-year project called Zac Paris Rive Gauche, the 13th arrondissement has become an area of startling urban regeneration. The once disused area of land between Gare d�Austerlitz and Ivry-Sur-Seine has now been revived to house a new university that will house some 30.000 students. The area also boasts the MK2 Biblioth�que, a vast cinema complex which, with its 14 screens, caf�s and exhibition areas, is already attracting keen film-goers. Connected to Bercy by a bridge, the area also offers new housing, schools and business opportunities as well as the new National Library : Biblioth�que Francois Mitterand, and the floating swimmingpool "Josephine Baker" on river Seine.